Rediff.com » Business » India: World's 3rd largest economy by 2030? India: World's 3rd largest economy by 2030? Global banking giant Standard Chartered on Wednesday said India could emerge as the world's third largest economy by 2030, benefiting from strong domestic demand and favourable demographics. However, the banking entity noted that country's reform agenda need to be sustained for achieving high growth. "India has the fundamentals to emerge a winner in the super-cycle, potentially becoming the world's third-largest economy by 2030. India is likely to grow faster, on average, than China over the next two decades," Standard Chartered Global Research said in 'India in the Super Cycle'. In 2010, the world's major economies were USA ($14.6 trillion), China ($5.7 trillion) and Japan ($5.4 trillion). India did not figure among the top ten, as per International Monetary Fund data. 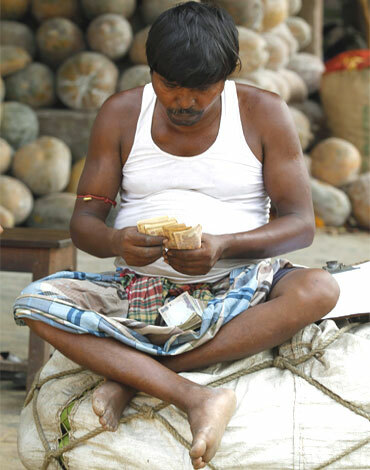 Image: A trader counts money at a wholesale vegetable market in Kolkata. By 2030, StanChart said India will be at number three position with an economy of $30.3 trillion, behind China ($73.5 trillion) and US ($38.2 trillion). It said that the country's demographic advantage, with half its population below the age of 25 years, with rising per capita income will ensure strong domestic demand. "India has many of the features that will enable it to emerge as a winner in the super-cycle. We believe the winners will be those countries which have cash, commodities, or creativity, or a combination of these factors. India does not have an abundance of cash or commodities, but it has creative potential," it said. 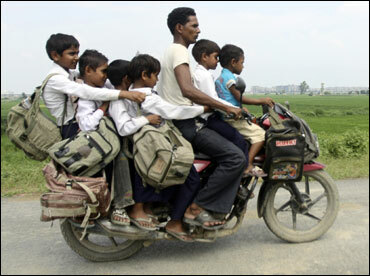 Image: A man rides a motorcycle carrying six children on their way back home from school at Greater Noida. StanChart said India has potential to catch up with China and the developed world. "Based on our forecasts, India's nominal GDP could top $30 trillion by 2030, against its current level of around $1.7 trillion. By 2030, India could be 8.4 times bigger than it is today, while China is estimated to grow 4 times bigger and the EU and US 1.7 times," it said. The banking giant said that within India there is often a hesitation to anticipate the ability of the economy to grow at a faster pace. "Often, consensus views of India's growth potential turn out to be too pessimistic. Thus, trend growth has often been assumed to be lower than that which materialises. Taking all of these factors together, our 9.3 per cent projection for average Indian growth until 2030 may prove conservative. Trend growth, in my view, could even be nearer 12-13 per cent per annum," it said. 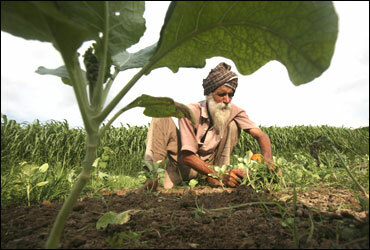 Image: A farmer works in a cabbage field at Mananna village in Punjab. By Super-Cycle, StanChart refers to the major periods of global economic growth. The first super-cycle took place from 1870 till the eve of the First World War in 1913 and saw the USA jumping from the fourth position to become the world's largest economy. The second super-cycle was from the end of the World War-II in 1945 and lasted till early 1970s and saw emergence of Japan and the East Asian economies. According to StanChart, the third super-cycle, which is currently in progress and has touched Asia, Middle East, parts of Africa and Latin America could transform the world economy over next few decades. "China is likely to overtake the US to become the world's biggest economy over the next decade... We factor in a trend rate of growth of 6.9 per cent for China, allowing for setbacks along the way, and of 9.3 per cent for India," the report said. It further added: "The opening up of India's economy, urbanisation, and greater infrastructure spending will support the 'catch-up' process." 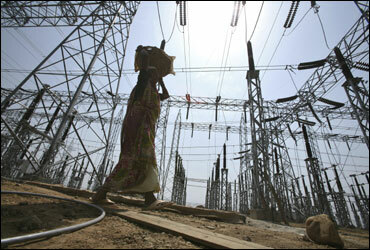 Image: A labourer works at the construction site of a grid power station in Jammu. StanChart, however, said that correct policy formulation by India is important. Infrastructure and job creation are major areas, it said. "India needs to overcome its regulatory burden and address its infrastructure needs. The initial focus, perhaps naturally, is on hard infrastructure, such as transport systems and energy infrastructure. But soft infrastructure is also key. "There is a need for continued improvement in education, health care and skills as India provides the sizeable educated labour force needed for its private sector to grow," it said, adding addressing issue of corruption is also important. Among the positive features of the Indian economy, StanChart listed a balance between consumption and investment and strong macroeconomic management. It listed infrastructure shortage, public health care and vulnerability to global oil prices as the major challenges for the country. 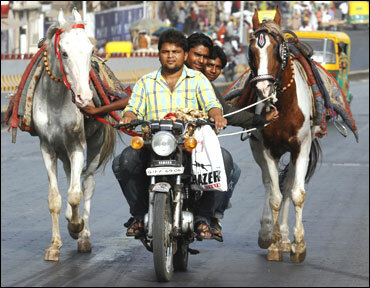 Image: Horse owners ride on a motorbike as they pull their horses along a road in Ahmedabad. India among 6 nations set to rule global economy!